There are many reasons why more commercial businesses are choosing a rooftop-based HVAC system when it comes time to upgrade. What might be surprising is that not all of these reasons, given below, are directly related to cost savings! In today's competitive and uncertain economic environment, more companies are turning to a focus on sustainability to win new customers and keep existing customers loyal. Rooftop HVAC systems have a variety of built-in options to improve sustainability and reduce your company's carbon footprint, both of which can be easy on the budget as well as attractive to the local community. Programmable thermostats. Individualized programmable thermostats for different areas of the building. Power choices. A variety of power choices that includes both electricity and natural gas. Air types. The option to use cooled or naturally cool outdoor air to cool the premises seasonally. Vents and dampers. A system of vents and dampers to economize air use after hours, on weekends, or holidays, and otherwise as needed. Fan speeds. Variable fan speeds to match airflow to temperature needs. Thermal wheels. Thermal (energy recovery) wheels to remove humidity and warm indoor air in hot months by sending it out through the exhaust vents. When the HVAC system is located on the rooftop instead of the ground floor and/or indoors, maintenance and repairs can be done without the need for repair crews to enter the interior of the premises where sensitive data and/or expensive items may be located. As well, the unit itself is safe from opportunistic vandals and thieves who may take unfair advantage of ground floor units. In addition, when the HVAC unit needs repairs or maintenance, there will be no need to relocate employees who may be unduly disturbed, or in the way, during the process. With the HVAC unit located up high on the roof, there will be no further need to try to camouflage the equipment or the noise it makes from visiting clients or partners. As well, the space that a ground-level unit might have consumed is now available for many workplace-enhancing additions, from a pleasant break area for employees and guests to additional VIP parking to more office space. Because rooftop HVAC systems are fundamentally space-savers, they are designed to be modular. This means that if you decide to reconfigure your office layout, expand your building or otherwise add to the existing HVAC demand for cooling and heating, your rooftop HVAC system can seamlessly grow with you. And because rooftop-based units are compact by nature, it is easy to add an extra unit even in space-scarce rooftop environments. While there is a high likelihood that all of your employees appreciate your HVAC system's heating and cooling, it is equally likely that no one particularly enjoy the noise it makes. When the HVAC system gets relocated to the roof, the ambient noise pollution is greatly lessened without sacrificing any of the temperature control benefits. Because of the many economies of scale that become attainable when transitioning to a rooftop HVAC system, workplace energy drain lessens noticeably in most cases. Energy is used more efficiently and there is greater control over HVAC system operation. And in amenable climates, the option to use cool outside air to lower the temperature of your indoor air can dramatically cut cooling costs in certain months each year. Provision must be made in colder climates to protect a rooftop HVAC unit from snow and ice accumulation as well as falling debris, but this holds true for any ground-level unit, too. However, there are many other environmental perils that the typical ground-level HVAC unit faces that rooftop units never have to cope with. For example, you will never run the risk of a delivery truck or visiting guest backing into your HVAC unit. Grounds crews won't miscalculate the distance between a falling tree limb and your HVAC unit. And there will be less debris, dust and dirt, vegetation, and other detritus collecting around your HVAC system. 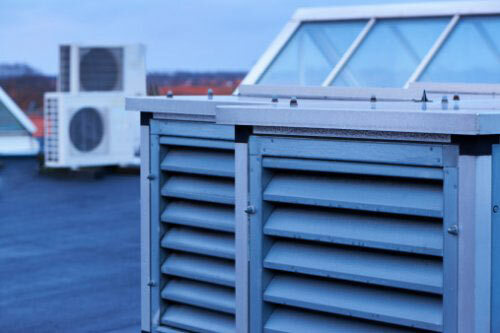 Because rooftop units are constructed with durability and longevity in mind, so long as regular recommended commercial HVAC system maintenance and parts replacements are performed on schedule, overall maintenance costs tend to be lower than for their ground-level counterparts. This stems in part from the rooftop location, where the HVAC system is far removed from vandalism, theft, damage, and accidents, and in part from the compact, modular, and energy-efficient design. If you are contemplating a shift to a rooftop HVAC system or need to schedule routine maintenance or repairs, Shipton’s is happy to be of service. With nearly a century of serving the Hamilton and surrounding areas, our family-owned and operated business has become a trusted name in the local community. Our commercial and residential customers trust us to provide the type of reliable service and cost-saving recommendations that keep bills low and comfort high. Contact Shipton’s today by phone at 905-549-4616 or online.